The ideal 4-piece drum pack for stage or studio. The DP4 is an excellent selection of 4 microphones that are industry standards for professional drum and percussion applications. Equally useful for studio as well as live sound, the DP4 microphones are known for clarity, sound isolation, high SPL handling, and durability. 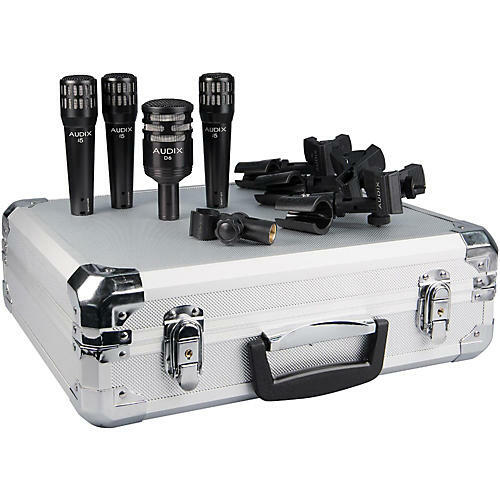 The DP4 mic package is ideal for professional drumers looking to mic their kit on the road or in the studio. The DP4 consists of one D6 kick drum mic and three i5 mics that are ideal for snares, cowbells and more. Also included are 3 MC1 mic clips and 3 DFLEX mounts for each one of the i5 mics, and a DCLIP for the kick drum mic. Everything is conveniently packaged in a foam-lined aluminum carrying case road case for safe keeping when the mics are not in use.